There are many ways to replace a missing tooth, but only one way to replace a tooth root. Implant dentistry involves placing artificial tooth roots in the jaw and restoring them with a custom prosthetic. With Chicago dental implant dentistry experts, Dr. Dinkha and Dr. Dotson permanently replace missing teeth in a way that looks, feels and functions as nature intended. Dental implants are small, titanium screws that anchor a replacement tooth or teeth. Titanium is bio compatible, which means that the body accepts it as a natural substance. Over time, the jawbone will grow around the titanium post, creating a secure foundation for a replacement tooth. With our Chicago dental implants services, Dr. Dinkha and Dr. Dotson can replace a single tooth or they permanently anchor a custom bridge, partial or denture. While traditional dentures are a great solution for people with missing teeth, they have many downfalls. Patients complain that after a while their dentures slip or click when they talk. This is because the hard and soft tissues of the mouth have changed shape causing the dentures to lose their stability. Implant dentures are permanently supported by dental implants. Dr. Dinkha and Dr. Dotson places a few dental implants into the jaw and then secures your custom denture to them. Implant dentures provide patients with missing teeth unparalleled support and function. Implant dentistry requires a brief surgery, so you must be in good health. Dr. Dinkha and Dr. Dotson will carefully examine your medical history, oral status and bone density to determine if Chicago dental implants will benefit your unique case. Dr. Dinkha and Dr. Dotson are qualified implant dentists who provide the kind of dental implants Chicago patients demand. They place and restore dental implants in the comfort of our Chicago dental spa. They will care for you throughout the entire dental implant procedure, from start to finish and see to your comfort with sedation dentistry. 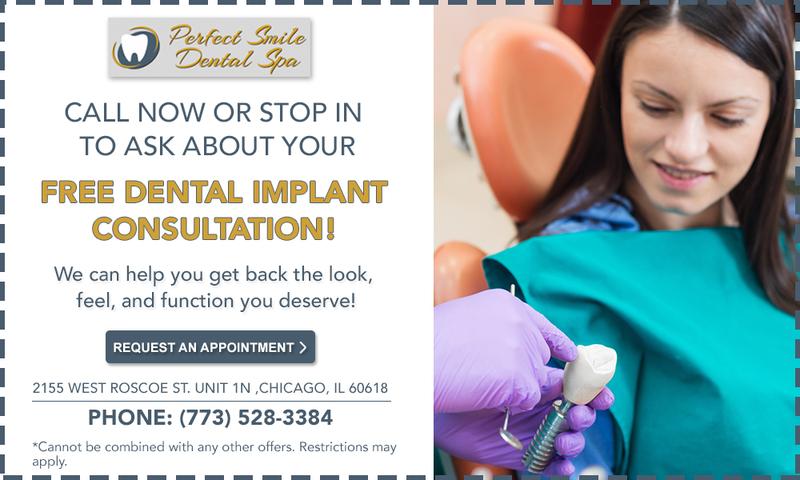 For more information on implant dentistry or to have the kind of dental implants Chicago patients trust call Perfect Smile Dental Spa or schedule your appointment online. If you need dental implants, Chicago has the best dentists in the country! We’ve been helping people in the Chicago land area complete their smiles for over 20 years. Dr. Christen Dinkha received her Bachelor degree in Biology from University of Illinois at Chicago with Sume Cume Laude. Dr. Dinkha then completed her degree in Doctor in Dental Surgery from University of Illinois at Chicago with highest honor (distinction). Dr. Dinkha was awarded Leo and Wanda sabine scholarship in honor of exceptional commitment in the care of others. Dr. Dinkha finds that dentistry not only satisfies her by transforming smiles of people but also that she is able to help people change their lives, that is very rewarding for her. She believes in providing dental care in a relaxed atmosphere especially for those who have dental anxiety. She ensures that patients receive superior dental care with comfortable and enjoyable environment. Dr. Dinkha’s experience and enthusiasm benefit the patient’s providing a wide range of services including fillings, root canals, crowns, bridges, teeth extractions, implant placement and restoration and full smile makeover. Dr. Dinkha attends seminars each year to keep up with the latest innovations in the dental field to provide her patients with high-quality care.